Muskmallow (Malva moschata): growing, planting, caring. A wild species of mallow. A wild flower that is actually perfect for our gardens and balconies: even an ideal plant for all those who do not have much time to devote to their garden! 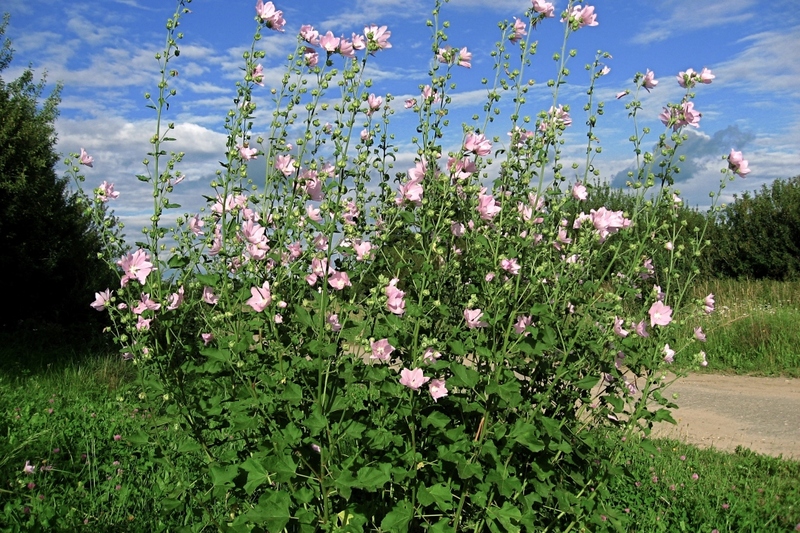 The musky mallow is an ephemeral woody perennial. 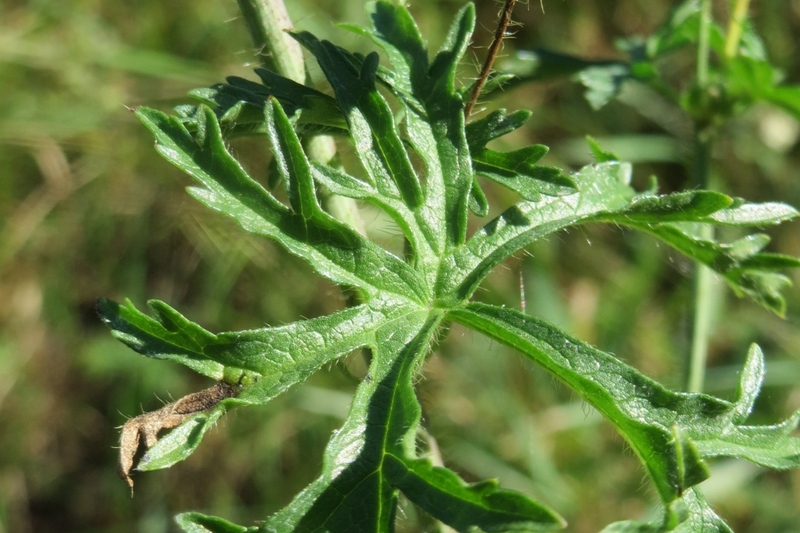 It has leaves of 5 to 10 cm whose musky odor has given its name to the plant. The upper leaves are pennatized - meaning finely cut. The flowers appear from June to October, in the shape of a flattened cup, with five petals, white or very pale pink. Outside: You can sow directly in place from March to June in lines or by broadcasting, in well-drained soil. If you sow in pots, prepare a mixture of sand and compost. In any case, the chances of success of your seedlings are better in a warm soil, so wait for a few days of good weather. After sowing, water gently every day until your plants have grown some leaves. 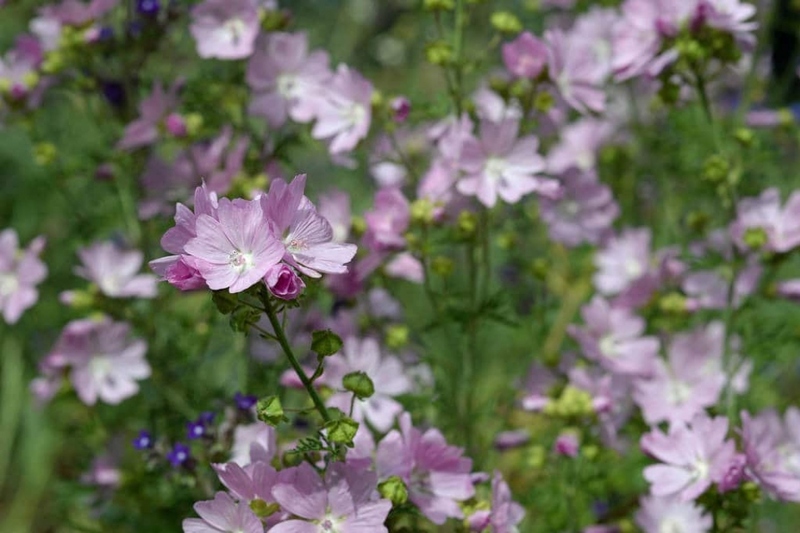 Inside: Sow the mallow under shelter, with 3 to 5 seeds one hole in each pot, from March to May. Use a mixture made of sand and compost. Cover the seeds with a shallow layer of soil, and tamp it with your hands. Water with a sprayer for the first few days. For seedlings grown in open soil, thin to 15 or 20 cm when the plants have 3 or 4 leaves. Repeat mallow seedlings in March to May or September to October, in the ground or in pots. Plant mallow in ordinary soil, well drained, in semi-shade. It is resistant to drought and withstands poor soils, and even limestone. I n pots, prefer a sunny spot, and a substrate composed of potting soil and garden soil. In open soil, dig a hole 3 times the size of the root ball. Mix a handful of compost with the original soil - if your soil is heavy add coarse sand, or even gravel for better drainage. Soak the root ball for 3 minutes. Install the plant and refill. For a beautiful mass effect, install at least 3 plants spaced 30 to 40 cm apart. Place very large varieties preferably in the background. In pots, drain with clay balls or gravel and add a mixture of potting soil and garden soil. When the plants are 30 cm tall, pinch them to help them branch - cut the main stem between the thumb and forefinger, above two leaves.